Gloveworks Heavy Duty Orange Nitrile gloves feature a true raised diamond texture for incredible grip. The bold, high visibility orange color really stands out and enhances safety. Gloveworks Heavy Duty Orange Nitrile has the dexterity of a 7 mil glove, but due to the enhanced texture, has the durability of a 10 mil glove. The perfect balance of better dexterity and better protection. This glove features excellent chemical resistance from common chemicals, like pesticides and many other specialty chemicals, such as iodine, brake fluid or butane. It is also powder free for working with sticky adhesives or wet paint so that no residue from your gloves can get in the way of a perfect finish. 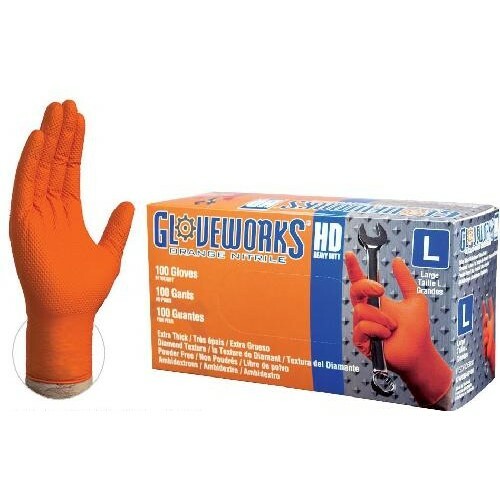 Gloveworks Heavy Duty Orange Nitrile gloves are commonly used for automotive, manufacturing, janitorial, plumbing, paint shops, heavy duty and industrial applications.